In the last two races, Alonso had the chance of ending the race on the podium, if not winning the whole thing. Both times the safety car thwarted his plans, and he ended up a mere 8th and 14th. 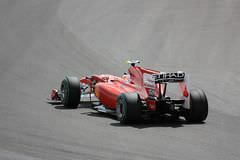 This has not been Ferrari's year, with Red Bull racing winning races and headlines, but even the title of 'championship contender' may soon be taken away from Alonso if he does not win a race soon.